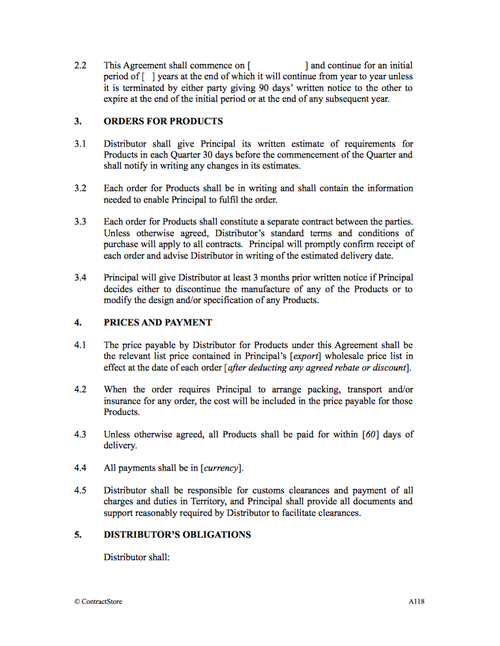 Who can use this Distributor or Reseller Agreement template? Any distributor whose business involves the resale of products bought from suppliers or manufacturers. 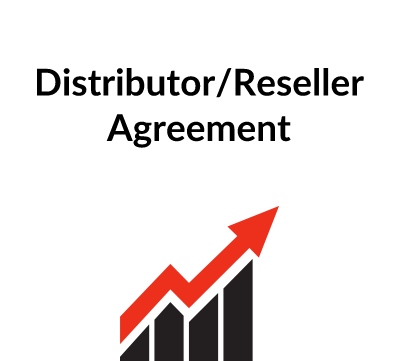 What is this Distributor or Reseller Agreement for? It establishes the terms on which the distributor will work together with the supplier. This is important, to give certainty to both parties who, together, applying the terms of the agreement, can work to promote sales of the supplier’s products by the reseller. For an agreement favouring the supplier, see our document A117. What are the main issues for a distributor or reseller? Territory and exclusivity. The agreement will normally specify an area within which the reseller will operate. The agreement will also say whether they have has sole and exclusive rights for sale of those products in the territory or whether it is non-exclusive. Usually, exclusivity is preferable for a distributor. Product Scope. If your supplier has a wide range of products you will want to decide whether the agreement should cover all or only certain of those products. If you begin with a small range, you may want the agreement to say it can be extended. Pricing & Payment terms. Obviously these are important, with the distributor wanting a god margin. Ordering & Deliveries. Will the supplier respond promptly to all orders for products? Product & Marketing Support. Is the supplier going to assist with marketing initiatives and general promotion? 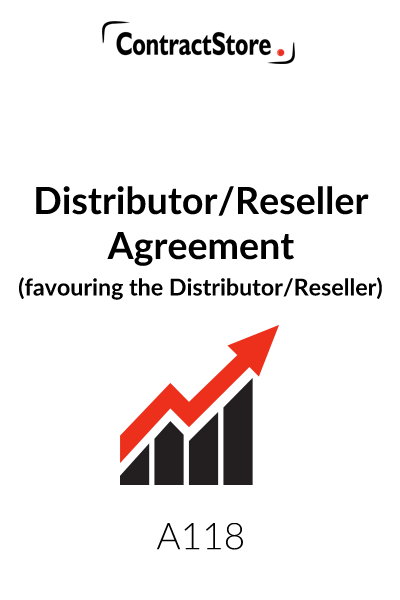 What detailed terms does the Distributor/Reseller Agreement contain? ContractStore supplies templates and is not a law firm. But all our templates are written by experienced lawyers. This template was written by the co-author of Exporting made Easy. So, we can arrange legal assistance for customers who need special terms in one of our documents or a bespoke template. . For more information see our Legal Services page. A Distributor buys for resale and each order placed by the Distributor will constitute a separate contract. Unlike an agent, a Distributor is selling on his own account and not on behalf of the Principal. Both parties will nonetheless want to be sure that the Distributor has adequate information and literature concerning the products as well as having a workforce capable of handling sales and any after sales or maintenance which may be required. Since this is a cross-border agreement – i.e. each of the parties is in a different territory with different laws – it is important that the Distributor has the agreement checked by lawyers in the Principal’s country – and vice versa. In some Gulf States, for example, the law does not recognise a distinction between a distributor and an agent and a distributorship agreement could be subject to local agency law and in some circumstances the agreement may be registrable and governed by the local law whatever the document itself may say. First, please note that this Agreement contains some clauses with alternative wording and some parts of the Agreement are in square brackets [ ] and/or italics. It is important to ensure that the final Agreement to be signed by the parties contains only wording that is agreed and that all alternative provisions and square brackets (and these Explanatory Notes) have been removed. Similarly, all blanks should be filled in before signature. There is more information on completing our documents at signing contracts. 10.6 Resolution of Disputes. The principal objective of this clause is to have any disputes which may arise resolved by an independent tribunal, not necessarily in the territory of either Principal or Distributor. This clause proposes arbitration in accordance with the UNCITRAL (United National Commission on International Trade) Rules. See our free downloads for notes on Dispute Resolution. 10.7 Governing Law. The law of the Distributor’s territory would normally be selected by the Distributor as the most appropriate. Again, see our free downloads on Governing Law and Jurisdiction.